Most children with Autism tend to get upset when there is a sudden change in routine. This can lead to stress, anxiety or even occasional meltdowns. 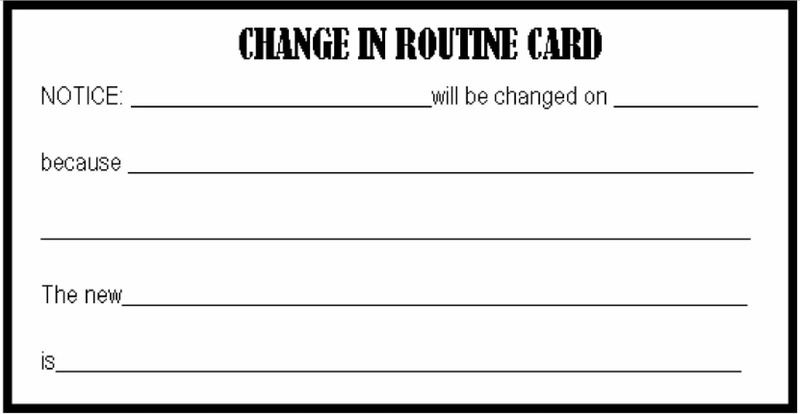 A “Change in Routine Card” is an extremely powerful tool to prepare your child for any upcoming change in circumstances. Download the Change in Routine Visual as shown below and get as many printouts as you need. CLICK HERE to download the PDF version. I also suggest that you DOWNLOAD this Quick Reference PDF Guide to use as a checklist while helping the child transition through activities. Now that you have the essential resources and the Tipsheet, you need to prepare your child for an upcoming change. When is the change likely to happen? How frequently will the change occur? What role does the Child need to play? I requested my friend Sean Kent from Geneva Center to post this video for you on how to use the Change in Routine Card. A common question that parents and educators often ask me is ..
How advanced the notice needs to be? Honestly, that depends on the severity of the change. For example, if you are just taking a detour to the grocery before dropping off your child to school, only a few hours of advanced notice using a single Change card should be good enough. However, if you are planning on a BIG change like enrolling your child into a new school or moving to a different city, you need to prepare for months in advance. Such a big change often involves multiple smaller change elements – each to be accompanied by its own Change in Routine card.